Brayden Sadler is lighting up the scoreboard in 2018-2019. Junior Brayden Sadler’s mother, Vanessa, graduated from Udall. Additionally, Sadler’s grandparents, Mark and Cinda, are Udall alumna. Growing up, Sadler watched Udall boys’ basketball enjoy a succession of winning seasons, most notably 2012. Led by Michael Propst, Udall advanced to the state tournament for the first time in school annals and eventually lost to undefeated Ashland in a close Class 1A, Division I state championship game at Emporia State University’s White Auditorium. The Eagles enjoyed a 22-4 record. Propst, who first signed with NCAA Division II Rockhurst (Mo.) University, was all-state from 2011-13 and averaged 26 points and 10 rebounds a game as a senior. Coach John Mayes enjoyed strong success from ’09-10 through ’14-15 with no fewer than 15 wins in any season. However, Udall has struggled the past three winters with just 13 combined victories. This season, Sadler, like Propst, is among the state’s leading scorers and has led a massive improvement, especially offensively. Udall is 9-4 and has a signature win against Howard-West Elk last Friday. The Eagles halted an 11-game losing streak versus WE with a 55-46 home victory. On Jan. 9, Udall fell 64-59 in overtime to West Elk. Udall is currently the second seed in the Argonia regional behind 8-2 Caldwell. Sadler, a 6-foot guard, has received help his parents, the River City Hoops team in Wichita and from Udall graduates Steve and Cheryl McDermeit. Sadler gave great credit to his mother, who raises three children by herself. Sadler has an eight-year-old brother and three-year-old sister. His grandfather works on the family farm. Sadler often made the 52-mile round trip to Wichita for practice and games with River City. The McDermeits built the Basketball Barn, a private training facility behind their home, northeast of Udall. Steve had coached for many years, including at Lebo and Washburn Rural and most recently served as the Udall assistant girls’ basketball coach. The Basketball Barn – basketballbarn.net – has the latest technology to track field goals, including sensors in the ball. McDermeit uses the 94 Fifty smart ball, a video projector, screen and sound system, according to the Cowley Courier Traveler. The place also has a one-bedroom apartment and kitchen, living area and bathroom. Sadler used to shoot with McDermeit every day and currently goes around every week. Sadler has focused on several aspects, including shooting quickly and getting his feet off the ground faster. As a freshman, Sadler averaged 13.2 points. As a sophomore, he delivered 16.2 points a contest. He shot 32 percent from 3-point range both years. This winter, he has upped the rate to 45 percent (38 of 84). “Breaking it down and showing me what I need to do, like analyzing my shot, just seeing if I need to jump higher, using more legs, or if I need to put my elbow in,” Sadler said. Overall, Sadler averages 26.9 points, 7.3 rebounds and 3.5 assists, all team-highs. He ranks second with 2.1 steals and has significantly lowered his turnovers to 2.9 a contest. Udall, which finished 6-15 last season, had a significant number of returners, most notably seniors Josh Fielder and Tristan Scurlock and junior Trevor Whiteman. Fielder, who finished fifth in Class 2A in the long jump and 400-meter dash last spring, averages 11.3 points and 2.4 steals a game. Fielder was the team’s standout quarterback for a 7-3 squad. He rushed 251 times for 1,551 yards and 33 scores. Sadler labeled Fielder a leader. Whiteman tallies 6.4 points, 5.5 rebounds, 2.8 assists and 1.6 steals. Freshman Austin King delivers 6.1 points and 4.1 rebounds, and Scurlock delivers three points and 3.6 rebounds. Last season, Udall averaged 56.3 possessions a contest. The Eagles delivered .732 points per possession and allowed .860 points per possession. Udall turned the ball over 28 percent of the time. This year, the offensive numbers are remarkably different. Udall averages 55.1 possessions per contest. The Eagles are up to .996 points per possession and allow .800 points per possession. Udall averages a turnover on just 17 percent of possessions, a very strong rate. “The communication we have had on offense, I think that’s a huge improvement that we have with more people scoring than what we have had in the past,” Sadler said. Individually, Sadler has become an extremely efficient player. Last year, 17.9 percent of Udall’s possessions ended with Sadler. Those possessions yielded .903 points per possession and turnovers 23 percent of the time. This year, Sadler ends 20.7 percent of possessions. He averages 1.28 points per possession and turns the ball over just 14 percent of the time. He also tallied 40 points against Cunningham on Dec. 14 and had 20 points, 10 rebounds and eight assists versus Pretty Prairie on Dec. 20. 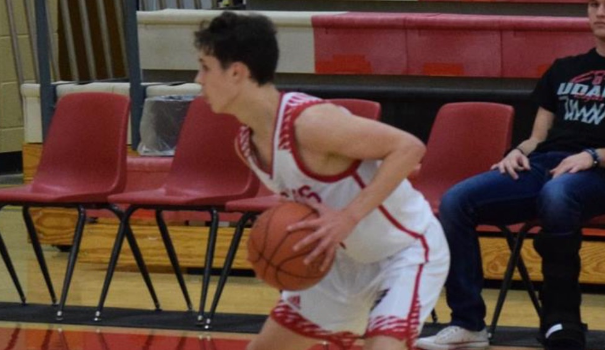 Sadler’s efficiency numbers compare favorably with Class 2A Ness City senior guard John Pfannenstiel, one of the state’s top players for all classes. Pfannenstiel, similar to Sadler in height and position, ends 24.4 percent of NC’s possessions, which yield .947 points per possession and turnovers just 10 percent of the time. A big difference came in the West Elk games. In the first contest, Udall had 12 turnovers. In the second game Friday, Udall committed just two, by far its lowest this season – and its lowest of any game in Sadler’s career. Basketball became apart of my life at the age of nine. At first it was a past time hobby that I didn’t take into concern, playing for local ball clubs, shooting around with friends every once in awhile and so on. The summer going into my Sophomore year I wanted to start taking basketball seriously because I could see the sport being apart of my future. I then joined River City Hoops, a basketball club in Wichita for the spring/summer league and I’ve developed into the ball player I am today. My goals this season are to help our team win as many games as possible. The past few years we’ve had a drought in the win percentages and I want to turn that around for the school’s basketball program. I say yes. Our team can play good basketball if we play to our maximum potential, which we’ve done a few times already this season. If we keep that up the sky is our limit. What makes me such a force as a player is my leadership skills, determination and commitment I bring to the team. I’d say we have a good atmosphere. Lately it seems like we’ve been getting bigger crowds at our games and that means we’ve been getting more support from our town which is always great news. Getting involved in high school sports in general is a good idea for anybody that enjoys community activities. Supporting student athletics should be a priority for all communities and if you come to Udall specifically you’ll see a game competitively played with honor and sportsmanship. My strengths are being committed to basketball outside of a school setting. I’ll put in work outside of practice and try to excel my craft more often than many of my peers. My weaknesses are not branching out and playing other sports. I haven’t taken advantage of the opportunity to play multiple sports. Josh Fielder, Tristen Scurlock, Isaac Patteson, Trevor Whiteman. I enjoy the challenges of leadership and the brotherhood of being a part of my team. I have not played any other sports yet, but I plan on running track to keep in shape for the summer basketball season. It’s great knowing that my coaches care about me off the court just as much as they care about me on the court. The knowledge and experience they attain helps lead the way in our abilities to improve in the game of basketball. In the off-season the team worked in the weight room, shootarounds, and summer practices. My plans are to help a college level team enter the next level of play. I want to win but also improve as a team and a player to reach the best of our abilities. Spending my time with family. It’s always fun to go somewhere to eat, participate in activities, or just stay around the house and enjoy the time you have with them. In 10 years I see myself engaging in the business sector or welding for an aircraft company. My favorite subject in school is Marketing. I like learning about different ways to market a product, or what you should do in order to make a business successful. I feel like i'm a good student throughout our school because i rarely miss, I hold good grades, and i don't have any behavioral problems. My current GPA is 3.625. My role models are my mother and grandparents. My mother is single and works to take care of her three kids. My grandmother is a retired teacher who served years as an elementary teacher and my grandfather works hard to keep in line the family farm. Riverside Cafe. It’s a hometown restaurant located in derby with great food and comfortable atmosphere. One thing the average person doesn’t know about me is that I’m a good cow-hand. I feed cattle hay for my grandfather.